"91 lessons that will raise your students' response writing to new levels. Readers Writing helps you build the skills kids need to move beyond retelling the plot to writing that reflects critical thinking. 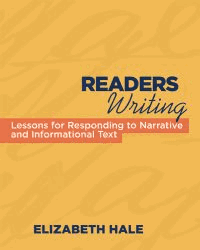 Lessons for both narrative and informational texts are supported by strategies for comprehension, conferring, assessment, and building independence. Preview the entire book online!"